With the revival of the country’s coffee industry and the rising demand for cocoa (commonly called Cacao in Visayan), the CoCoPal (Coconut, Cocao, Palay) eyes to improve the local cacao industry in Western Mindanao through a training workshop dubbed as Western Mindanao Cacao Development and Investment Forum (WMCDIF) last September 4-5 at the Ariana Hotel, Dipolog City. The two-day forum were attended by several dignitaries and experts in cacao industry from Mindanao, Visayas, and Australia. One of the important personalities that grace the forum was Simon Bakker, a representative from the Kennemer Foods International, the company behind the famous M&Ms chocolate brand. ZN Provincial Agriculturist Maybelle Bustaliño expressed her optimism to the growth of cacao industry in the province saying that the industry is not new to the people of Zamboanga del Norte since it already existed several years back. She added that the industry’s stagnation was due to the lack of credible trading in the market and its scanty demands. The forum was made possible through the CoCoPal Program is a project of the NGO’s ACDI and VOCA sponsored by the USDA which aims to improve the capacity and food security of smallholder farmers. Among the sub-programs implemented by the CoCoPal Programs are the Value Chain Foods, Security Income, and Generation of Integrated Farming System.joint forces of United States Department of Agriculture – Agricultural Cooperative Development International – Volunteers in Overseas Cooperative Assistance (USDA-ACDI-VOCA, three organizations that promotes “value chain of cacao, coconut, palay” through the CoCoPal Program. The forum was also co-presented by the Zamboanga del Norte Provincial Government, Local Government Units of Dipolog, Dapitan and Polanco, Department of Agriculture-IX, and Cacao Industry Development Association of Mindanao Incorporated (CIDAMI). CAGAYAN DE ORO CITY ­ Cacao farmers are expected to increase their production following the signing of a Memorandum of Agreement (MOA) for the establishment of an additional 10,000 hectares of land for cacao plantation in the region. Stakeholders said that the main objective of the agreement is to have a steady supply of cacao beans intended for the world market. Another factor under the agreement for the establishment of a wide area devoted to cacao production is to provide the Agrarian Reform Beneficiaries (ARBs) a chance to benefit from the growing demand of cacao beans in the global market. The MOA was signed Monday by officials of the Department of Agrarian Reform (DAR), and Kennemer Foods International, Inc. (KFI). DAR Secretary Virgilio de los Reyes led the signing of the agreement, together with DAR Undersecretary for Support Services Jerry Pacturan, and KFI Managing Director May Lynn Lee. It was learned that the KFI is an international organization that specializes in growing and trading of high­quality agricultural products ­ particularly fermented cacao beans. It was also learned that the KFI carries complete agricultural support ­ from planting materials, training, agri­technology, and up to the market. Under the MOA, the Agrarian Reform Beneficiaries will be assisted in consolidating their produce through block farms. The project provides the technology that will help the ARBs increase their income, and develop sustainable agribusiness enterprises. Agriculture experts see Mindanao as suitable for cacao growing due to its favorable climatic condition. For his part, KFI President Simon Bakker said their company needs more cocoa beans for the global market. Meanwhile, the DAR disclosed that the Philippines’ annual consumption of cocoa is considerably high, yet the country’s production is only about 6,000 tons per year. As this developed, the ARBs are expected to greatly benefit from the additional areas intended for cacao farming, eventually enabling them to supply the growing global demand. BECAUSE of the huge market of cacao abroad, Kennemer Foods International Incorporated (KFI), a leading exporter of cacao product will be extending financial assistance through loan for cacao farmers especially for the beneficiaries of the agrarian reform in Zamboanga, Saranggani and Sultan Kudarat hopefully by next year. Working in partnership with Landbank of the Philippines Inc., the leading exporter will provide financial assistance to interested cacao farmers who will be given the chance to borrow up to P75,000 per hectare. KFI chief executive officer Simon Bakker said that with the Cacao Contract Growing Program and partnership with the Department of Agrarian Reform (DAR), borrowers will get assistance and will have convenience in paying their tenancy since they will pay starting on the third year and the next two years. The first two years of the grace period will allow farmers to propagate their cacao crops. In addition, farmers and cooperatives will pay in a form of cacao beans or through the buy­back system offered by KFI. Half of their harvest will be go directly to KFI while the other half will be kept by the farmer. He also added that aside from loan, they also provide planting materials like high­yielding, six­month old, clonal cacao seedlings which is included in the agreement. This is to assure that the farmers will be getting quality cacao seedlings. KFI area manager Guadalupe Ocial said farmers can also get free technical assistance from their technicians who will train them the process of field preparation, planting, management of the gestation period, harvesting, pest management and maintenance and rehabilitation of older cacao trees. Currently, cooperatives like Laak Multipurpose Cooperative in Laak, Compostela Valley (ComVal) and Maragusan Multipurpose Cooperative in Maragusan in ComVal from the region avail this loan through the Cacao Contract Growing Program. Bakker said that this will help in reviving the cacao industry in the island’s region because of its climatic appropriateness for crops, specifically cacao. Seated: UP Vice President Elvira Zamora, KFI President Simon Bakker, UP President Alfredo Pascual, NCIP Provincial Officer Cristito Ingay, Obu Manuvu Datu Luis Lambac, UP Mindanao Chancellor Sylvia Concepcion, KFI Manager Guadalupe Ocial. 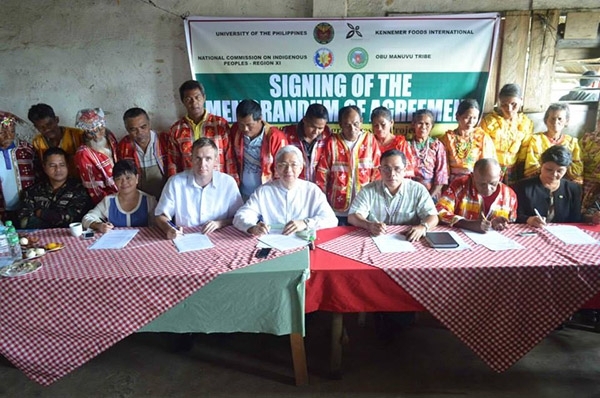 The University of the Philippines signs an agreement with a private sector food company and an indigenous group in Mindanao for an agro­forestry development project which is expected to improve the economic well­being of the indigenous community. Kennemer Foods International had expressed its interest in establishing a cacao plantation in the UP Mindanao Land Reservation in Marilog, which is part of the ancestral domain of the Obu­Manuvu indigenous people. A diligent study including a series of consultations and consensus­building involving the parties were held and led to the signing of an agreement. On 18 October 2013, amid the festive atmosphere in the neighborhood of the UP Mindanao Land Reservation in Sitio Ladian Marilog, Davao the following affixed their signatures in the MOA: UP President Alfredo E. Pascual, KFI President Simon Bakker, National Commission on Indigenous Peoples Provincial Officer Cristito Ingay, and Obu­Maunuvu Datu Luis Lambac. The members of the Obu­Mnuvu indigenous people donned their ceremonial attire, and together with UP Vice President for Development Elvira A. Zamora, AVP Cristopher Espina, UP Mindanao Chancellor Sylvia Concepcion, local officials and tribal leaders witnessed the landmark event. Thursday, 16th April 2015 would bring positive ripple effects for gainful employment, production incentive, agricultural technology, and eventually revenue share that could fund improvement in education and health care for the community. A free UP education with stipend would also be available for those who will qualify from the poor among them, a statement which was met with applause. Finally, he hoped that the tribes’ educated youth, in return, would pay forward to their ancestral lands to spur more developments and to care for the natural resources for future generations. UP alumnus Elias Lopez, who championed the creation of UP Mindanao in Congress, was acknowledged by NICP Officer Ingay, and echoed by Pres. Pascual and other tribal leaders as the pride of the Obu­Manuvu tribe and a prime example of a member of indigenous people who was born poor and lifted himself and his condition through UP education. In the meantime, for its part, KFI has vowed to, among others, provide annual financial contribution for the School of Living Traditions, set up scholarship programs and hire qualified members of the tribe to work in KFI’s corporate farms. After years of digging for gold, copper and zinc, employees of TVI Resources Development Philippines Inc. (TVIRD), the local affiliate of Canadian miner TVI Pacific Inc., will return a favor to the land by planting cacao. TVIRD, through its subsidiary TVI Agriproducts Inc., recently signed a partnership deal with Kennemer Foods Inc., a supplier of US-based Mars Chocolate, to turn about 1,600 hectares of land near mining sites into cacao plantations in the next four years. Before the company winds up operations at the 500-hectare Canatuan mine in Siocon, Zamboanga del Sur, its subsidiary will establish a cacao plantation near the mining site, which is part of the 8,000- hectare ancestral domain of the Subanon tribe, says Renne Subido, TVIRD vice president for corporate social commitments. The agribusiness subsidiary has been created solely for the joint agricultural enterprise to sustain company workers and those who directly benefit from the mine as operations draw to a close in the last quarter of 2013. According to company geologists, the ore content at the Canatuan mine will be depleted before 2014. “This is a livelihood which we want to become industrial-scale. We are putting our resources to make sure that the income streams steadily go to the community,” Subido says. The 50-50 partnership with Kennemer includes contract-growing agreements with small farmers, technology and knowledge transfer, and capital investments for infrastructure and equipment, according to Subido. A memorandum of understanding with Kennemer was signed at TVIRD’s Makati headquarters. Under the agreement, landholdings will be consolidated either through lease or revenue-sharing agreements with individual farmers, lot owners and recognized indigenous peoples’ communities. Each plantation will have a consolidated area of no less than 100 hectares. The landowners, according to TVIRD, will get 4 percent of the total revenue based on the farmgate prices of commodities, most of which are for export. Kaycee Crisostomo, spokesperson for TVIRD, says that other crops used to be planted on the property. But it will be easy for the company to convert the land into cacao plantations. Cacao, according to the Department of Agriculture, is a cash crop. Its trees, which can grow in just a year and a half, can bear beans all year round. TVIRD PRESIDENT Eugene Mateo and Kennemer Foods Inc. president Simon Bakker will be working together to establish cocoa plantations in Canatuan, Zamboanga del Norte. Each hectare of land can accommodate 500 trees. It takes two to three people to tend to each hectare. That means, for each hectare, two to three people can enjoy the fruits of their labor. TVIRD said the project can generate close to 1,300 jobs for the local community while its 400 workers will be absorbed in the joint-venture company. If wages were to be combined, the project could generate P100 million annually. Although there is no estimate yet on the capital expenditure, the two companies will need to spend for road construction, post-harvest facilities, buying stations, transport, as well as storage facilities, Crisostomo says. Eugene Mateo, president of TVIRD, says the joint enterprise will be one proof that agriculture and mining can be done side by side. “Agribusiness is the natural direction given the geographic composition of the area. This is a testament that mining, agriculture and other revenue-generated enterprises like tourism can coexist and actually support each other,” Mateo explains. TVIRD, the first company to operate under the Mining Act of 1995, ramped up its operations in 2004. In the last eight years, the company contributed around P724 million to the communities and the local government unit of Siocon through excise and real property taxes, business permits and royalties to the indigenous communities. “We know that mining is not there forever. But we want to make sure that we are leaving the communities capable of standing on their own feet,” Crisostomo said. TVIRD still has mining sites in Bayog in Zamboanga del Sur, and in Agusan del Norte. Although company officials have announced that they will be closing the Canatuan mine, operations at the site still continues. TVIRD wishes to expand its Mineral Production Sharing Agreement coverage to areas northeast of their Canatuan mine, which are believed to be rich in copper and zinc. The request to expand operations is still pending with the Mines and Geosciences Bureau. The Mindanao Fruit and Vegetable Summit on October 20-22, 2011 held in Davao City proved to be an opportunity for Cantilan Bank to meet with value chain players in the sector and strike partnerships that promise to be beneficial to both the farmers and the bank. The summit brought together farmers, buyers and business leaders in a bid to address challenges faced by farmers and agriculture-based companies along the fruits and vegetable commodity value chains. Aside from discussions on benchmarking, best practices, and global marketing, the event featured business matching for producers, buyers, and bankers. The summit was also a venue for aspiring agri-entrepreneurs to learn how to start and grow a farming business. Emiterio Sanson Jr. of the United States Agency for International Development (USAID)-supported Rural Bankers Association of the Philippines-Microenterprise Access to Banking Services (RBAP-MABS) program brought together Cantilan Bank and Kennemer Foods International, a leading exporter of quality cocoa beans, to work on the expansion of cocoa production in Mindanao. In partnership with farmers, Kennemer plans to plant and maintain at least 10 million productive cocoa trees over the next 3-5 years. As a major player in the value chain, the company works on grouping and training farmers, provides planting materials and farm inputs, handles post harvest requirements, and buys the cocoa. Cantilan Bank will help address the financing requirements of cocoa producers and enhance its existing micro-agri loan product to match their cash-flow needs. Mr. Simon Bakker (left), Cantilan Bank’s General Manager Raul Urbiztondo, and Eric Mendiola, Head of Credit Unit (partly hidden)Initial collaboration between Kennemer Foods and Cantilan Bank Tagum Branch is expected to take off in San Isidro, Laak, Davao del Norte, where more than 2000 small farmers tending an estimated 5500 hectares planted to cocoa are presently introducing modern techniques and rehabilitation methods. Kennemer Foods also maintains two other community models in Davao del Sur and in Calinan, Davao City, where the company has plant nurseries, field technicians and postharvest facilities. Cantilan Bank is also poised to start a partnership with the Davao Provinces Rural Development Institute Inc. (DPRDI), based in Tagum Davao del Norte, for financing farmers engaged in organic farming. Carrying the brand “Healthy Grains Organic”, DPRDI works with several farmers organizations composed of 1000 rice farmers in the municipalities of Banay-Banay and Lupon, the rice granary of Davao Oriental. Under the program, farmers receive training on organic farming and other technical services of DPRDI that help increase the farmers’ markets as well as overall income and reduce risks. Partnerships and networking with organizations that are major players in the commodity value chain offer banks the chance to expand their lending to agriculture and reach more farmers while mitigating the risks of lending. Cantilan Bank, a participating bank of the USAID-supported RBAP-MABS program, which has been offering its micro-agri loan product to small farmers using the MABS Approach, is now one of the banks leading this effort in Mindanao. DAVAO CITY (MindaNews/03 October) – The City Agriculture Office is tapping small farmers rather than large-scale plantations in the city’s bid to become the country’s top cacao producer. Leonardo Avila III, City Agriculture Office chief, said there might be no need for the large-scale plantations because cacao can be planted along with other high-value crops or integrated in farms that are already planted to coconut, coffee and durian. The city’s cacao development program started in October last year and aims to plant at least 1,000 hectares a year. “We are continuously educating small farmers, conducting trainings and nurturing cacao seedlings in our nursery,” Avila said, adding the growing demand in the local and world markets pushed the city government to promote cacao among small farmers. A worker wraps cellophane over newly-grafted cacao seedlings at the Cocoa Foundation of the Philippines’ Cacao Agribusiness Zone Center in Talandang, Tugbok District, Davao City on Thursday, Sept. 29, 2011. The Davao City Agriculture Office is encouraging farmers to intercrop cacao between coconut trees, fruit trees and other crops to help increase farmers’ income. MindaNews Photo by Ruby Thursday MoreHe noted that the US and Europe are the leading markets for cacao. He cited that the city’s terrain and climatic condition are suitable for the crop. “Not everyone likes to eat durian while cacao has a potential market here and abroad. Everybody wants to eat chocolate and the consumption is growing,” he added. Data at the World Cocoa Foundation website showed that chocolate product consumption has been growing at around 3% per annum. From 5.5 million tons in 2001, it rose to 6.5 million tons last year. Marilyn Carubio, Cocoa Foundation of the Philippines Technical Adviser for Mindanao, said the country produces 6,000 tons of cocoa a year about 80 percent of which is from Davao Region. Carubio said that the production in the Davao region, particularly in the city, will increase in the coming years given the persistent advocacy of the city government. The price range of dried cacao beans is at P100 to 125 per kilo while wet beans cost P28 to P32 per kilo in the local market. Marilyn Carubio, Technical Adviser of the Cocoa Foundation of the Philippines’ Cacao Agribusiness Zone Center checks on the cacao fruits in Talandang, Tugbok District, Davao City on Thursday, September 29, 2011. She said a single cacao tree can yield 1.5 to 2 kilograms of dry beans per harvest which can be sold at P125 a kilo. An hectare of land can be planted with up to 1000 cacao trees. MindaNews Photo by Ruby Thursday MoreWith the opening of the Cacao Agribusiness Zone Center in Barangay Talandang in Tugbok District, Carubio hopes that more farmers will now engage in cacao farming. The facility, which opened in January this year, has 24-ton capacity fermentation boxes, sets of solar dryers and hybrid (artificial and solar) dryers, a central nursery, budwood garden, and a training hall. “We are offering a free training to the farmers and we are the ones who will come to the barangays or we can also conduct it here in the center,” she said in an interview. Dario Divino, CAO’s industrial crops specialist, cited the areas of Calinan, Marilog, Paquibato, Toril and Tugbok districts as suitable for cacao farming. “If a farmer has an hectare of coconut trees, let’s say if he can insert about 900 cacao trees, that’s an additional income already. That’s at least P150,000 of extra income already,” Divino said in an interview. He added that a cacao tree can yield around 1.5 to two kilos of dried beans or around a ton of dried cacao beans per hectare. Upon seeing the potentials of the city in cacao production, a Manila-based food company sent a letter to Mayor Sara Duterte expressing their interest to invest in cacao industry. To realize the city’s potential as a key producer and processor of cocoa beans, Bakker proposed that they would lease a 4.5-hectare land in Calinan to serve as the site of our central processing facility and operational headquarters. “To entice farmers to plant cocoa by providing them long-term growing contracts and financing, assure the farmers with a buy-back of their cocoa harvest at competitive price linked to the cocoa terminal markets in London and New York and develop 10,000 hectares for cocoa in Davao City,” he said in the letter. He said the contract-growing package will include the provision of seedlings, inputs, training and assistance with farm and crop management. “To make all of these possible, we intend to invest P100 million in nursery and post-harvest facilities alone for this project,” the letter concluded. As part of developing agroforestry program of the city, Avila said they have chosen cacao since it is a low-maintenance crop. He added that through the Sustainable Agroforestry for Rural Upland Communities, it can help conserve the city’s watersheds as well as alleviate poverty. Divino shared the same views saying that unlike mango, cacao is not a high-maintenance crop that requires a lot of chemicals to be able to produce high yields. “Cacao can thrive anywhere, it can adopt in our climate. It doesn’t require a lot of maintenance. Look at the farmers in very remote areas. They can still produce good harvest of cacao without using any chemical or synthetic fertilizers. But for mangoes, you need to spend a lot of money in spraying chemicals to have a good harvest,” explained Divino, who used to work as supervisor of a plantation. Divino, meanwhile, added that this is the reason CAO is focusing on small farmers because they can easily adapt to the technology. “The problem with plantations is that, if the owners change their mind and they want to plant another crop, you have to cut down the cacaos. This is what happened in our company before,” the agriculturist added. Meanwhile, Avila said the city has a total of 162, 000 hectares of agricultural land 105, 000 of which is intended for agroforestry development. Aside from cacao, crops like cassava, coffee, coconut, durian and rubber are also being eyed to be promoted under the agroforestry program, he said. As of June 10 this year, data from CAO showed that cacao farms have reached 1, 139 hectares. These are in Calinan, Baguio, Tugbok, Toril, Paquibato and Marilog districts. Avila said these are also the same areas they are eyeing for agroforestry development. The data showed that on top of the list is coconut with 16,000 hectares followed by corn (8,328 has), Cavendish banana (6,411 has), mango (4,133 has), durian (3,462 has), Lakatan banana (2,034 has), pineapple (1,706 has.) tundan banana (1,341 has), rice (1,310 has. ), and then cacao.